Gold crochet bag, £10 from The Past Perfect. "This bag is a little bit disco with the sparkly gold crochet! It would make a great addition to any wardrobe, you’ve gotta love a bit of vintage sparkle to jazz up an outfit!" Blue dress, £8 from Standing on the Landing Vintage. "I liked the simplicity of this dress and it had an almost sporty charm to it! Team up with some crisp white plimsolls and you’d be good to go!" 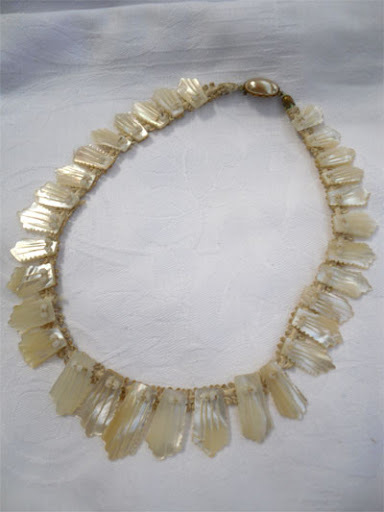 Mother of Pearl necklace, £20 from The Side Room. "I absolutely loved this mother of pearl necklace, the Art Deco shaped pieces sewn onto the delicate lace. A very charming piece!" 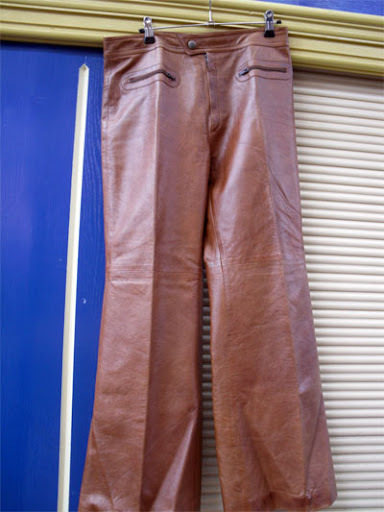 Leather flares, £20 from Absolutely Allsorts. "How totally fabulous are these tan leather flares and so this season with the 70s vibe! The lady on the Absolutely Allsorts stall, Joan, was telling me how she used to wear these and she can still fit into them today – my photography doesn’t do them justice, they were amazing!" Men’s tie, £4 from Maria Frances. "How kitsch is this silk tie? 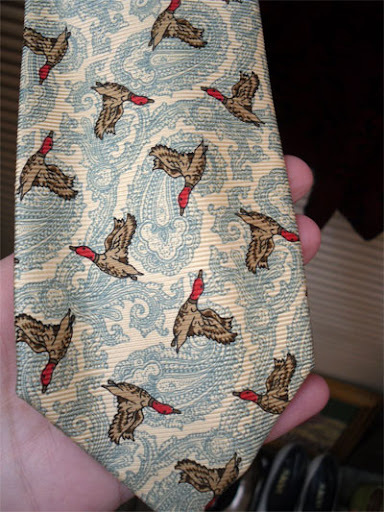 – paisley print and ducks combined! This is super fun and would brighten any dull days at the office! I’d like to see this clashed with tweed or a bit of corduroy for the ultimate eclectic English gentry look!" Cushion cover, £4 from Vintage Surprises. 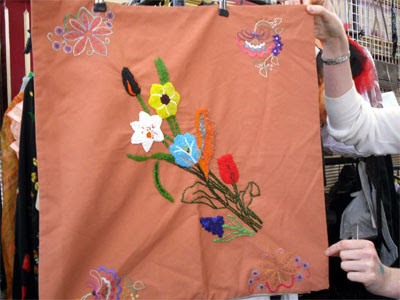 "Floral embroidery and beading combined on this super sized cushion cover!" 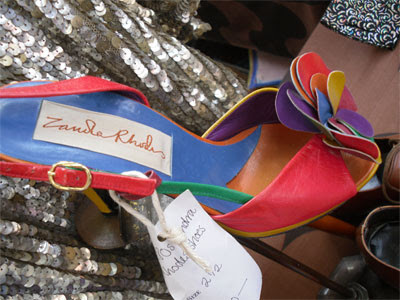 Zandra Rhodes shoes, £120 from TinTrunk. "Oh my – these shoes are simply perfect! I had to snap these - the bold colour infusions screamed out at me! If only my feet were a size 2½, then I could have strutted my stuff all summer long in these!" Please meet Amy Young, our finder for this month. Amy works in PR and marketing for a footwear company, a job she is well suited for given her passion for fashion. She admits to "a mild shopping addiction" and clearly has a well-trained eye for unique vintage pieces! Go and check out her blog - "it was only" - and you can follow her on Twitter too. Wooden box, £5 from Acorn Curiosities. 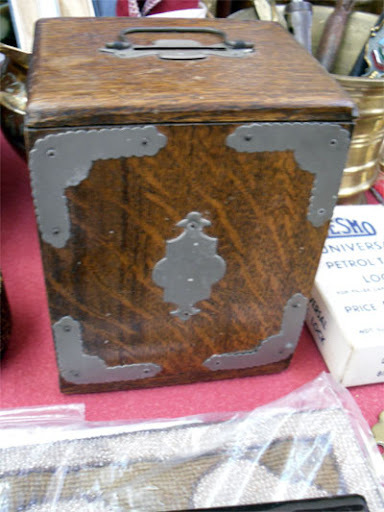 "I loved this little old money box with metal detailing. What a great way to store left over coins in style - gone are the days of using an old Bells whisky bottle!" Russian books, £5 from Eclecta Books. 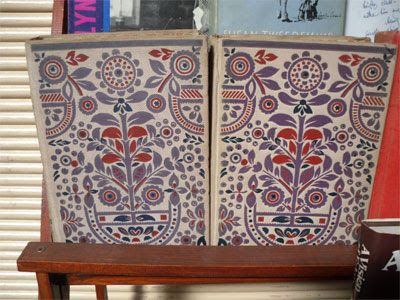 "They say you shouldn’t judge a book by its cover – it was hard not to with these Russian books. I was instantly drawn to their unusual decorative covers. Although I can’t read Russian, the inside pages are filled with many a captivating illustration. I snapped these books up for myself – not quite sure how I am going to display them to best effect yet though!" Leather collar box, £20 from Rachel Crompton. "What a great addition this would make to stage any dressing table. 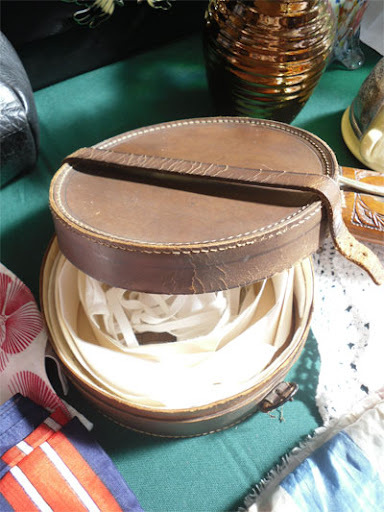 The leather collar box came complete with a selection of vintage collars too. A simple piece that speaks for itself!" Pump Pot, £10 from Agnes Darling. 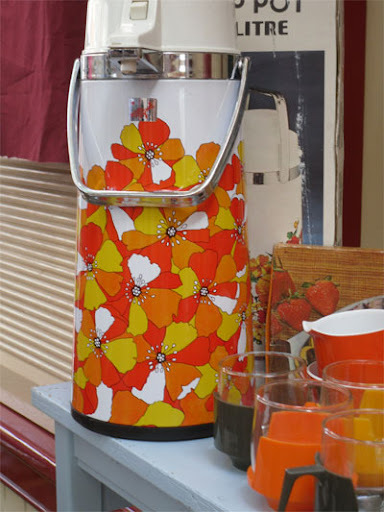 "Is there any better way to brighten up a camping trip than with this floral pump pot. This is sure to leave fellow campers envious!" Royal mug, £5 from Parrot and the Pantry. "With the impending Royal Wedding I couldn’t resist taking a picture of this! 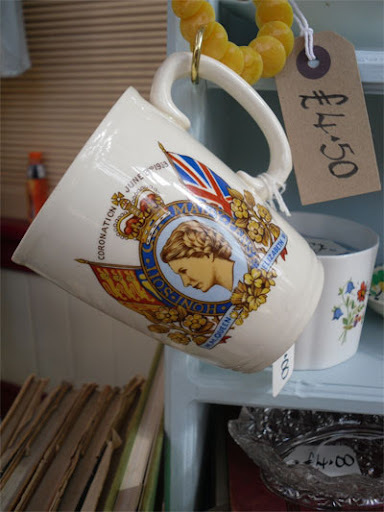 I often find royal memorabilia quite twee but this mug seemed to hit the right note - just enough nostalgia combined with practicality, perfect for having a cup of tea whilst watching the Royal wedding on TV!" 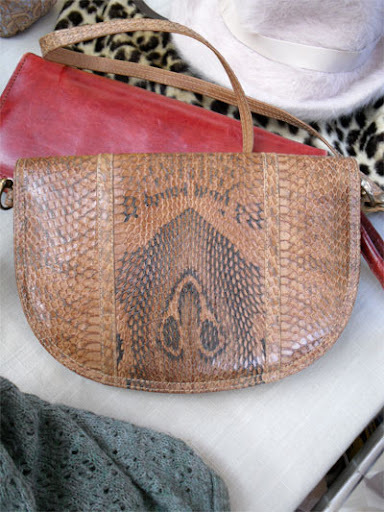 Snakeskin bag, £18 from Village Vintage Clothing Ltd.
"This bag caught my eye from afar! 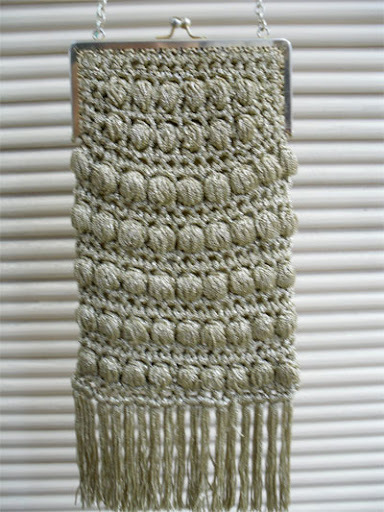 I loved the half moon-esque shape, something different than your everyday rectangular options!"